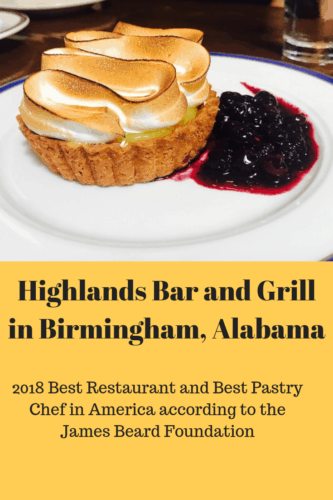 Highlands Bar and Grill in Birmingham, Alabama, has consistently ranked at the top in every list of . Recently, though, the James Beard Foundation gave it the award for being the best of the best in America, 2018 Outstanding Restaurant, and that comes after being a finalist for nine years. Those who dine there concur. It is unmatched for service, cuisine and meticulous attention to the details for creating an unforgettable evening. Menu: The menu at Highlands Bar and Grill changes daily to reflect seasonal availability of meats, seafood and produce. For example, guests during the cooler months might expect quail and venison with root vegetables. Spring could bring soft shell crabs to the menu, and the summer will feature fresh tomatoes, squash, and okra. No dish is prepared in an ordinary, humdrum way. Each has layers of flavors that only come from skill, creativity, and the very best ingredients. On a recent menu, for example, one entree included a braised rabbit leg, a bacon-wrapped rabbit loin, sweet corn puree, and jambalaya okra. Another was the yellowfin tuna with farro verde, watermelon relish, and a roasted jalapeno. Diners can look forward to an enticing number of selections of beef, pork and seafood dishes. The culinary staff at Highlands describes its offerings as being French-inspired Southern dishes. Starters are intricate, also. Stone ground baked grits are popular, along with several featuring locally-grown vegetables and eggs. The oyster bar menu lists the locations where the raw oysters were harvested and also tempts diners with ceviche, crab claws and Gulf shrimp. Even the dessert menu changes seasonally, with recent late summer offerings such as muscadine sorbet and a cherry tart. The wine and beverage list is extensive and includes a half-dozen Temperance Drinks made from fresh juices. Thoughts: If you are looking for a place to splurge for a special occasion of any kind, then you won’t find a better place in Alabama than Highlands Bar and Grill. Be sure to make a reservation well in advance, though, because ever since the 2018 awards were announced, the phones at Highlands have been ringing incessantly. Owner and Executive Chef Frank Stitt III is an Alabamian by birth and by rural childhood experience. After high school, he spent college years studying philosophy in Massachusetts and California before realizing that his real passion was food and cooking. Through a series of work experiences and introductions, he became an assistant to Richard Olney, a renowned chef in Provence, France. Stitt began experimenting with ways to incorporate French cooking methods into his beloved Southern cuisine, looking forward to one day opening his own restaurant. That dream became a reality in 1982. His mother and several other investors believed in him, and Highlands opened in November of that year. The success was so quick, that the investors were paid back in full within four years. Frank’s wife Pardis is responsible for the front-of-house operations, and exquisite service is one of the hallmarks of Highlands. She has trained the staff, many of whom have been with the Stitts for more than 30 years, and has helped them create an atmosphere that is exceptional. Diners may expect gleaming linens, fine china and crystal, but the extra attention comes from uniformed servers who are intimately knowledgeable about the menu and are able to anticipate your wishes for your meal. One of the people who started out with the Stitts is Dolester Miles. Her cooking skills are self-taught but extremely effective. She has been making desserts at Highlands for more than 35 years. This year the James Beard Foundation awarded her the 2018 Outstanding Pastry Chef title. By all means, save room for dessert when you visit. Her Lemon Meringue Tarts and Coconut Pecan Cake are legendary. Each is worth every calorie. The Stitts have since opened two other restaurants in the Five Points area of Birmingham, Bottega, and Chez Fonfon, both of which are wildly popular as well. Highlands was pitted against restaurants from New York City, New Orleans, and other major foodie destinations. The people of Alabama are happy to see Highlands recognized among the elite in the restaurant world. Price range: Starters are $11-18. Entrees are $30-40. Desserts are $10. Connie is a native Alabamian with a veterinarian husband, 3 married children and 13 grandchildren. She has traveled extensively in the U.S. and around the world and lived in Ecuador for 4 years. She loves eating where the locals eat, interviewing chefs, photographing beautiful food presentations and learning new preparation methods, ingredients or flavor combinations. Connie's book "Telling It On The Mountain: 52 Days in the Life of an Unlikely Missionary" was published in 2016 and is available on Amazon.In addition to her blog, www.theregoesconnie.com, she is a regular contributor to The Yums,Trip101.com, MilesGeek.com, Epicurean-Traveler.com, ShortWeeks-LongWeekends.com and other print and online travel publications.